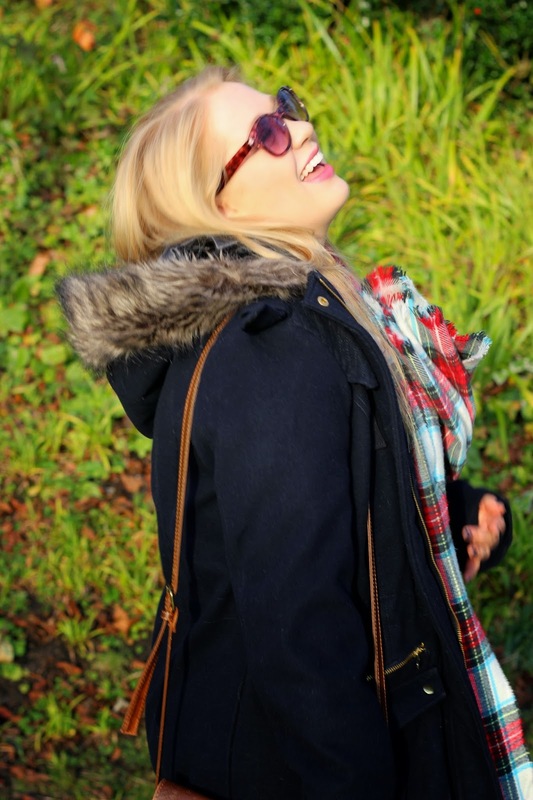 This outfit is one of my favourites for winter, its warm and incorporates some of the things I love to wear most, its also super comfy so great for Christmas shopping, long walks around the park, lectures, or just chilling with friends. Most of these items I've had for a while, other than the scarf which I picked up from Primark at the beginning of Autumn and I've been wearing ever since. The sunnies are also a recent addition that my mum picked up for me in the sale at M&S and they're really cute, with a pinkish tinge to them. Both the boots and the green jumper, which I love as it's my favourite colour, I picked up in the New Look sales earlier in the year and as soon as it started to get a bit colder I've been wearing them all the time, I love how well the scarf goes with the jumper. Add in a pair of leggings, my trusty Primark bag and this necklace I got as a gift from my Canadian friend Megan, that always makes me miss her when I wear it, and you've got an outfit I love to wear. I love how these photos came out, I'll definitely be visiting this park again to take some more outfit pictures. I'll have to drag Josh along as well to be my photographer! I wish you all a very merry Christmas and hope you have a lovely day with friends and family. Let me know what you're most looking forward to for tomorrow! Im looking forward to lots of food and drink and spending the day with people I love. Third year of Uni is tough. Dissertations take up a lot of time and then theres all your other modules on top of that! So its safe to say I've spent a lot of time in my room attempting to do all this work, and because of that I figured I'd be honest and show you a variation of what Im wearing most days. Comfy clothes are necessary when you're spending the day studying, and if you're not leaving the house then anything other than pyjamas is just pointless. These bottoms are from Primark, my favourite place to get comfy pjs, and to add some festivity into my day of researching sexual violence during wartime (such a cheery dissertation topic) I usually add a pair of Christmas socks as I have a slight obsession with them. This fluffy jumper is also from Primark and it's so cosy and warm and the perfect addition to a cosy outfit. My room is basically a freezer between the hours of 10 and 5 when we can't afford to put the heating on, so keeping warm is vital, I usually wrap myself up in this John Lewis blanket and if it gets really cold I might end up under my duvet, but I try not to do this as it usually results in an impromptu nap. I've come up with a few other ways to keep myself warm and cosy, and this cat wheat bag from New Look is one of my favourites, you put it in the microwave for a few minutes and it heats up and stays warm for ages, I personally think it's better than a hot water bottle and a lot cuter! A warm drink is also compulsory during studying, my favourite is this salted caramel green tea from Twinings which I mentioned in my monthly favourites as it tastes amazing! I always have it in my favourite mug as well, Josh brought me this Love Bug mug from the museum when we visited York over the summer. Variations on this outfit include my UCLAN hoodie, or thick fluffy socks, sometimes if it's really cold I'll put on gloves so I can feel my hands while Im typing. Occasionally I have to resort to a mini dance party by myself to warm myself up a bit! The joys of being a student. What's your go to outfit for keeping warm and cosy? 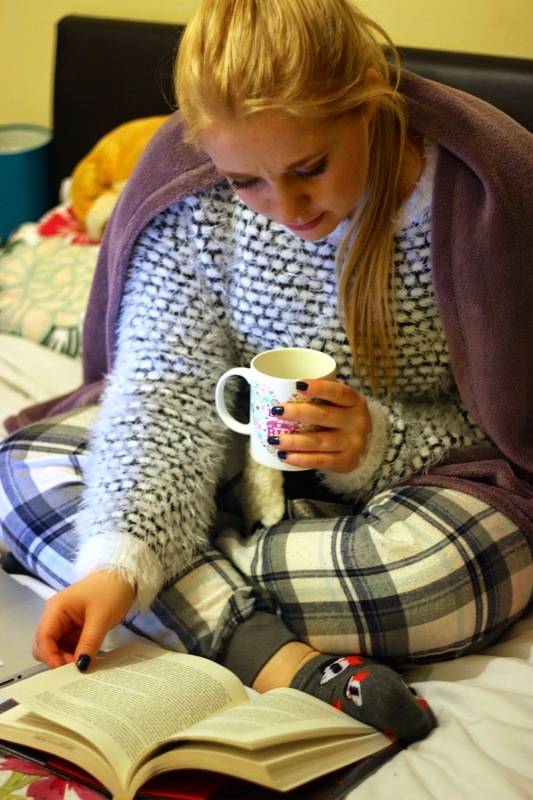 If you're a student do you spend a lot of time in your PJS like me? I saw this Christmas Tag over on Hannah's blog and decided to get myself in the festive mood and give it a go. As I'm spending most of my time writing my dissertation I haven't had a chance to really get excited for Christmas so hopefully this tag will get me in the festive spirit! The Grinch is definitely up there, along with Love Actually and Home Alone. Im a sucker for Christmas films though and will watch anything Christmassy once it hits December, really gets me in the festive mood. Always Christmas morning. As a kid I used to love running downstairs early in the morning and finding the tree surrounded by presents, and then everyone gathering around while the youngest of the family gave out the presents and then everyone would open them all together shouting thank you across the room. The joys of a big family. Christmas is my favourite time of year so I have lots of memories, but in general it would be playing games on Christmas day like Around the World, Charades, Articulate and Heads Down Thumbs Up. I'll also always remember all the family performing plays my Grandad had written, these led to some hilarious moments. Food is one of my favourite things about Christmas time. I love it all! The Christmas dinner, stuffing, turkey, pigs in blankets and roasties, and then Boxing day with bubble and squeak, gammon and yummy pudding. Along with boxes of chocolates, pin wheels, biscuits, cheese, champagne, wine, wine and more wine! Getting a macbook was a pretty amazing present as I wasn't expecting it and I loved it a lot, and it was my first laptop. As a kid presents were so exciting and I remember being so happy, now I love Christmas as I always get the things I need like socks, pants, PJs or things like razors and toothbrushes! This year Im getting car insurance which is something I definitely need, but unfortunately can't really be wrapped up under the tree! All of them! I love cinnamon, spiced apple, vanilla, gingerbread, pine and the smell of christmas dinner. It's one of my close friends birthday on Christmas Eve so since I was about 16 all our friends will go out on Christmas Eve to celebrate and have a few drinks and a dance. Although it has meant I've had a few hangovers on Christmas day it's worth it, and I find the best way is to just drink through them! Depends what we're feeling, we've got stars and angels and usually me and mum decide as we're decorating. I don't remember ever asking for anything crazy, I used to go through the argos catalogue and circle half the toy section, and I probably asked for a mobile phone before I was old enough for one. Family, friends and food. I love spending the day with my family and some of my best memories are from Christmas days in the past. I also love celebrating with friends, whether thats house Christmas dinners at Uni, work Christmas parties, or Christmas Eve partying. The food is also a pretty great part about Christmas and I'd be lying if I didn't say I was super excited about it! 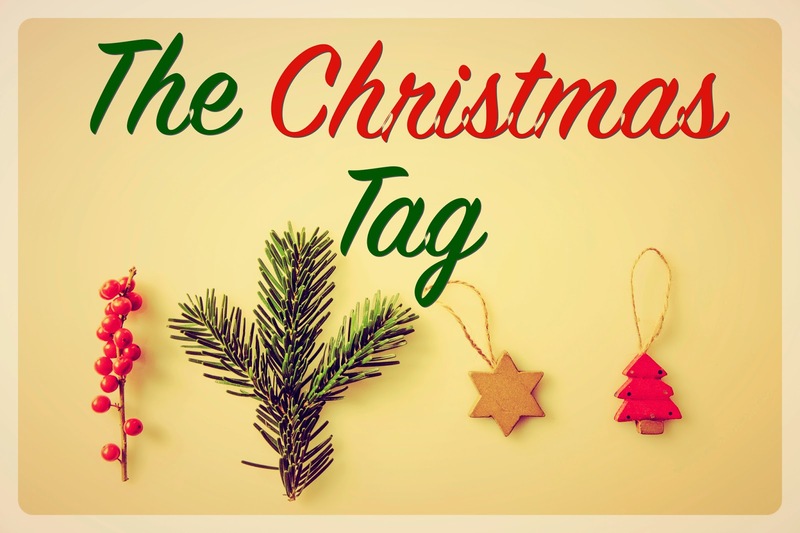 Have you done a Christmas Tag? I'd love to hear your answers, leave me links below. I hope you're in the festive spirit and getting excited for Christmas! 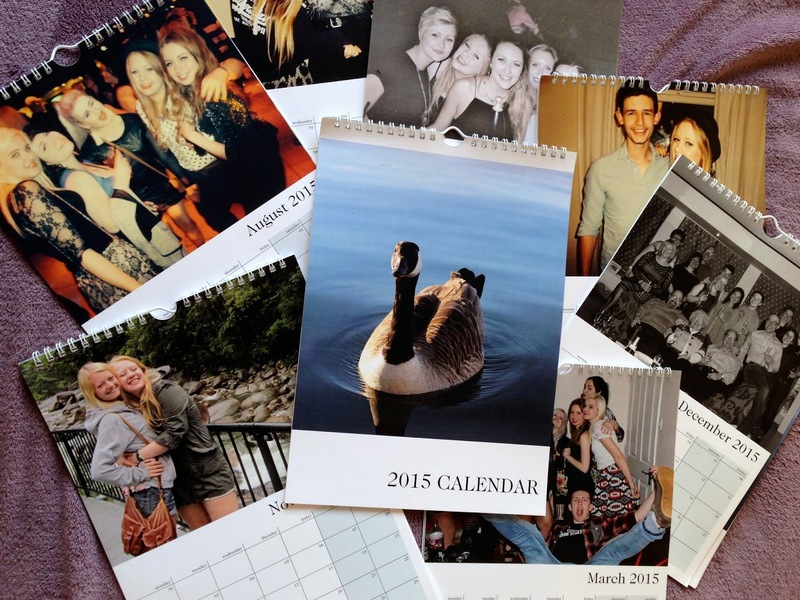 It's getting very close to the end of 2014 but theres still a few things I want to do before the year ends. 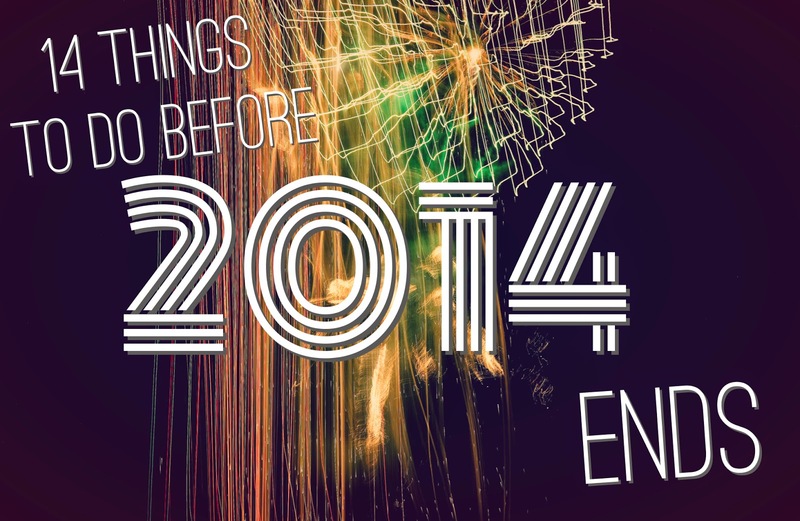 So taking inspiration from Clare heres my list of 14 things to do before 2014 ends! 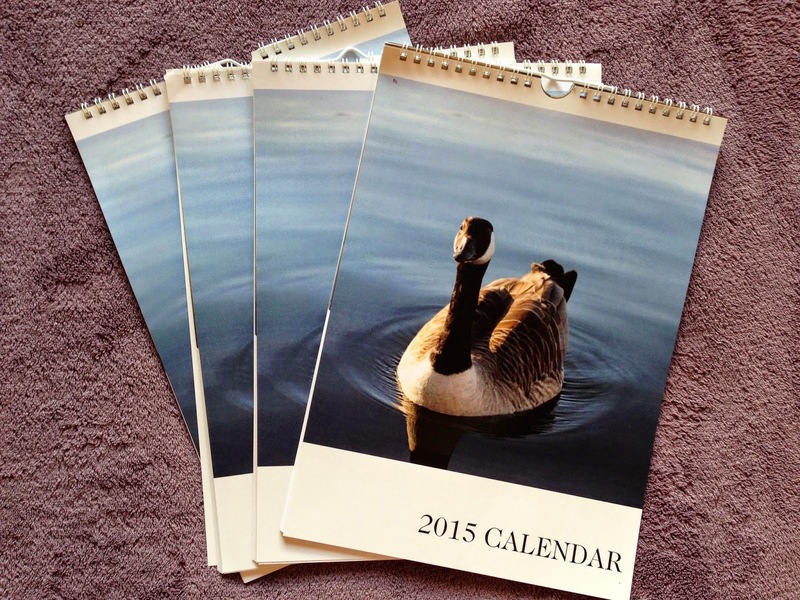 What's on your list to do before the year ends? Uni libraries can be both life saviours and absolute hell. Depending on the time of day and year it can be near impossible to find a desk, especially one with a working plug socket, it's either boiling or freezing there is no comfortable temperature, and you are more than likely going to want to kill either yourself or someone else whilst your there. In fact wanting to kill someone at the library is a common feeling for most students, especially third years trying not to cry into their dissertations. 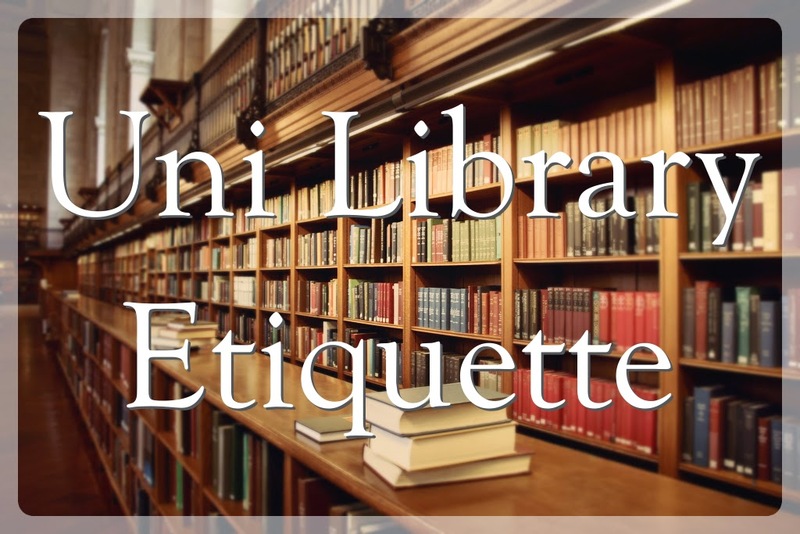 So I've put together a list of things to avoid doing in your uni library, unless you want to be hated by everyone around you. 1. Long hours at the library can often mean missing meals and therefore food is a necessity, however be careful what you choose. Any food that has a strong smell is an immediate no go, tuna, pickle, curry anything that you wouldn't want to kiss someone after eating is off limits. Stick to plain and non smelly. On another note, loud food should stay away from your lunch box. Sweet wrappers, that are going to rustle every time you touch them, or anything that makes a lot of noise when eaten will drive your fellow students insane! 2. Phone calls. Either text or take that phone call somewhere else. 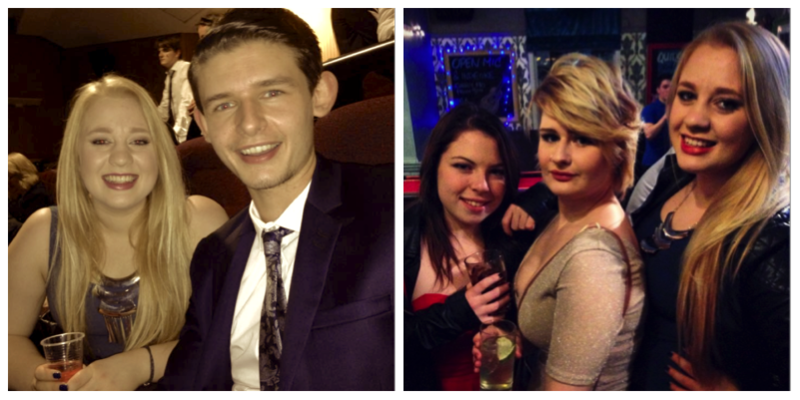 Toilets, stairwells or social areas anywhere that's not a studying zone. 3. Listening to music is vital for a lot of students and that's fine as long as everyone else isn't getting a taste of your current favourite playlist. You may have headphones on but that doesn't mean the person next to you can't hear every song! 4. Group work is a part of most degrees and the easiest place to gather everyone together is the library, but either work in the non quiet areas, or book a room out. You could even meet at a cafe or in a different uni building, just stay away from the library or you'll probably be shushed and evil eyed until you leave. 5. Be healthy. Colds spread like wildfire at uni, and the library is the breading ground so if you're ill stay away until you're not coughing up germs all over the place. Sneezing and constantly sniffing will drive people insane, so stay in bed watching netflix until you're better. That's an order! 6. Finding an available computer, or an available desk during lunchtime can be a nightmare, so be kind and don't go to the library to sit on Facebook or watch a film. It's just going to anger everyone who walks past desperate to get on with their work, and why do you want to be at the library watching a film when you could be at home in your bed?! 7. Probably the most important one, don't talk! I know that seems strict but if it's a quiet area, and especially if it's a silent zone DO NOT CHAT. Nobody wants to hear you catching up with your mate about what happened on the weekend or about your appointment at the doctors. If you want to socialise go anywhere but the library. And if you have to talk, whisper and keep it under 5 minutes. 8. Finally, and this one is very important. Take a shower. Personally hygiene is of the up most importance in the library, and being a bit on the smelly side is going to really make people want to kill you. What do people do that drives you crazy in the library? Or are you guilty of any of these crimes?! In Monday's post I spoke about the ups and downs of November, and to get me through those downs I've been on many a shopping spree spending money I really don't have, and I've also spent a fair amount of my time in my room keeping as warm and cosy as I can even though my room resembles a freezer most of the time! Theres been a fair few things I've been loving this month, like loving to the point where I want to tell everyone all about them, so I decided that's what I would do and here is my first ever monthly favourites post. To start with I have to talk about these slippers from Primark which have hardly left my feet all month. I love them so much I even brought a second pair that live at my boyfriend's house so I never have to be apart from them. They're the cosiest slippers I've ever had, and unlike 'bootie' style slippers these don't make your feet get super hot. At something like £6 they are such a bargain and I think everyone should go get a pair! Also from Primark is this tartan scarf which I wear with almost everything. I just think it's perfect, not too big and heavy, just right, and it looks lovely I think. As it's Primark it's also a lot cheaper than some of the other tartan scarfs around at the moment. It's getting close to Christmas and Im starting to get excited, but as Im not at Uni for the holidays Im not decorating my room, but as I spend probably 70% of my time in my room doing work I've been loving burning Christmassy smelling candles to both get me in the festive mood and to cheer me up while Im reading for my dissertation. This candle is the from Yankee Candle, Simply Home range in Holiday Magic, and it smells amazing. Like Christmas in a candle! I got it as part of a Winter Votive Set from asda, which has 6 Christmas scented candles in it. Something else I've been loving this month is Slim Fruits, these are yummy little sweets that are super low in calories, fat and sugar. I posted a review of them recently where you can read a bit more about why they're so great. I've been loving munching on these when I need a little sweet treat. In September I treated myself to a perfume, and being the Marc Jacobs addict that I am I had to try out Daisy Dream, and I was not disappointed. It's a little bit different from other perfumes I've had before, it has a sophisticated fruity smell, but it's not sharp or citrusy. I know it's been talked about by a lot of bloggers and I can definitely see why. I also love the bottle, a bit less showy than some of Marc Jacob's previous perfumes. The mascara I've been using recently is Barry M's Showgirl. I got it free when I purchased 2 nail polishes and I wasn't expecting much, but I actually think it's really great. It separates my eyelashes and gives great length and a decent curl. I love it because it doesn't clump and isn't to wet. 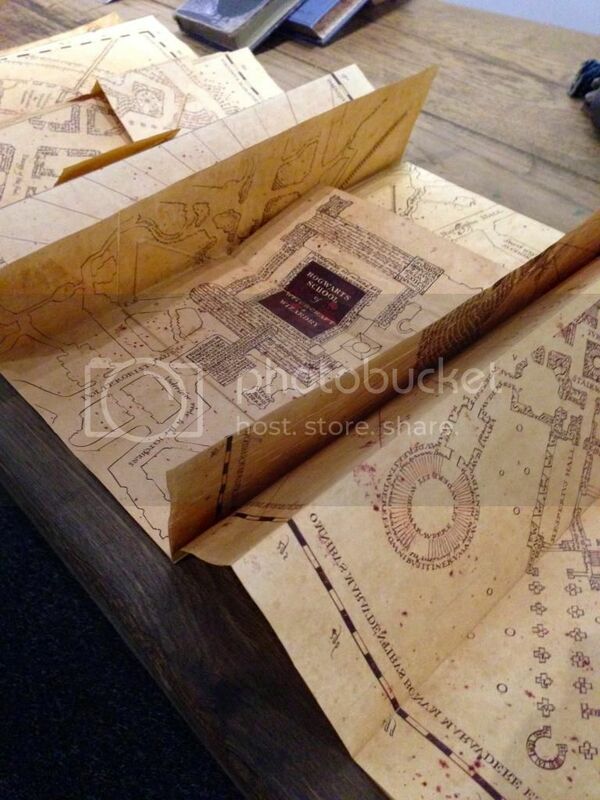 I also love the packaging, its quite heavy and I think it looks quite expensive. The only down side is it's staying power, as I always get mascara on my eyelids when Im applying and this can be difficult to get off. When I saw Twinings Salted Caramel Green Tea in the supermarket I knew I had to have it, and it was one of the best decisions I've made all month! This stuff tastes delicious, and if you love Green Tea and have a bit of a sweet tooth this tea is for you. It tastes like a pudding but without the calories, you really get the caramel flavour and it smells amazing. It's great when you just need something comforting and I've been having a mug of this and getting curled up into bed with a good book a lot this month. The last thing I've been loving is this list book from Paperchase. One of the things that triggers my anxiety is being unorganised and feeling like I have loads to do, and this book has been a bit of a life saver for me. It's a list book so you can rip out the pages and start fresh each day which I love. Each day I write down the things I need to get done and tick them off, It also has a section where I can just jot down notes or general things I need to get done. I keep this with me all the time so whenever I think of something that needs to be done I can add it in and know I won't forget about it. If you're the sort of person who loves lists I'd really recommend a notebook like this. It's so satisfying and motivating. I'd love to know what you've been loving in November, leave me a comment below. I am a very lucky girl who has a very amazing friend. 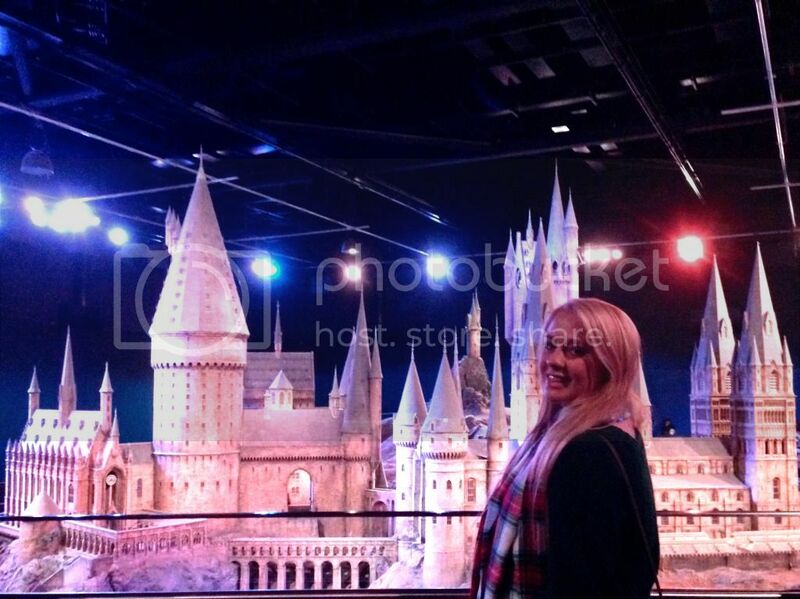 When my friend Charl told me she had a spare ticket to the Warner Brothers Harry Potter Studio Tour and she was inviting me along I could have cried. As a huge Harry Potter fan I've been wanting to go for a really long time, but either couldn't afford it or couldn't find someone to come with me, so when Charl asked me to come along with her, I said yes yes yes! 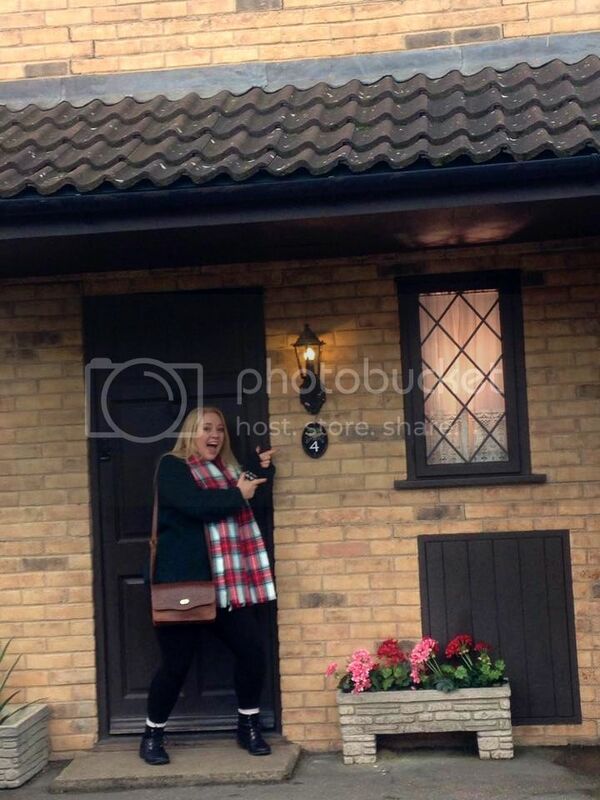 As I live within driving distance of the Studios we decided to stay at mine for the weekend and I'd drive us there. We took a lot of photos, so much that both our iPhones died at the same time, also as we were taking photos on our phones the quality isn't great, but you can still get a sense of how amazing it was. This is going to be a very picture heavy post, and if you haven't been to the Studios and want it to be a surprise when you do go, look away now, I won't mind I promise! 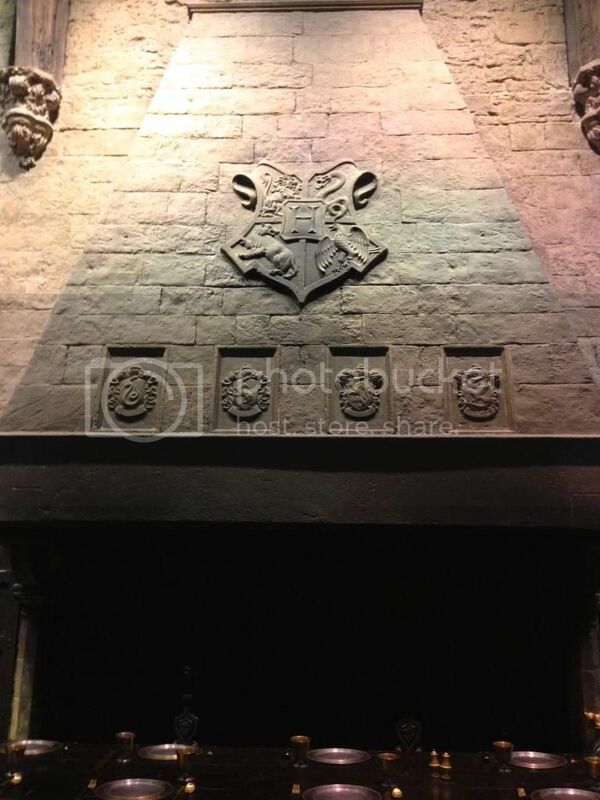 The Great Hall was really amazing, as it was the exact set used in the films it was so amazing to see it in real life, the floor was even made of stone! In the hall they had the tables set up and at the end they had mannequins of the teachers dressed in outfits the actors had worn. 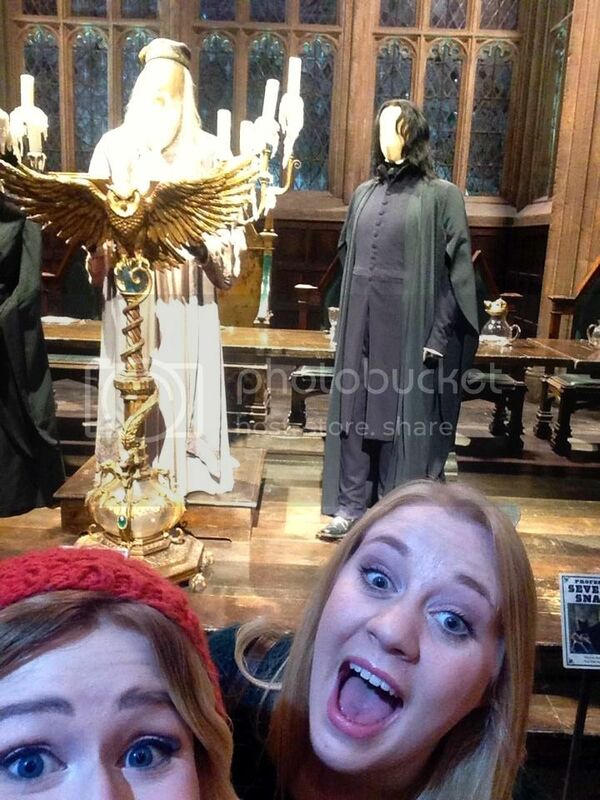 We obviously had to get a selfie with Dumbledore! 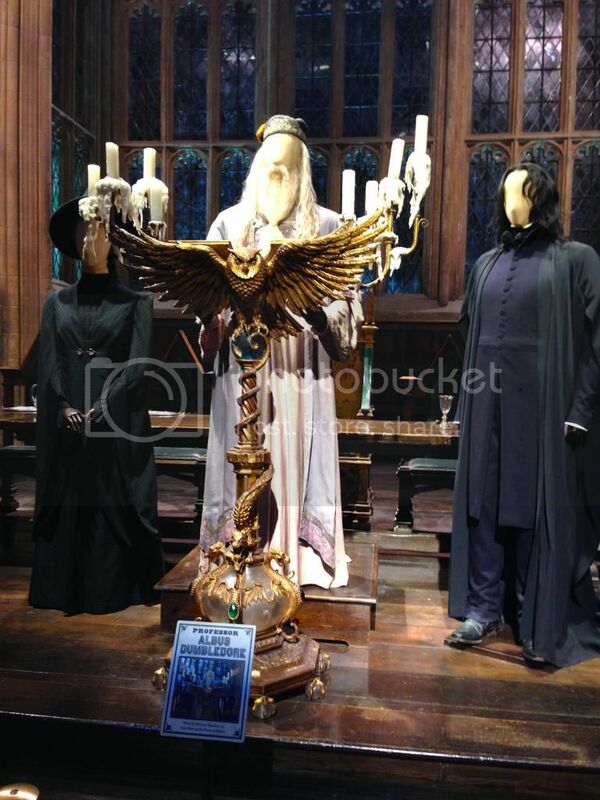 After the Great Hall we moved through to the next section which had the smaller sets and all the props as well as costumes, wigs, and information about the different aspects that go into making such a big film. 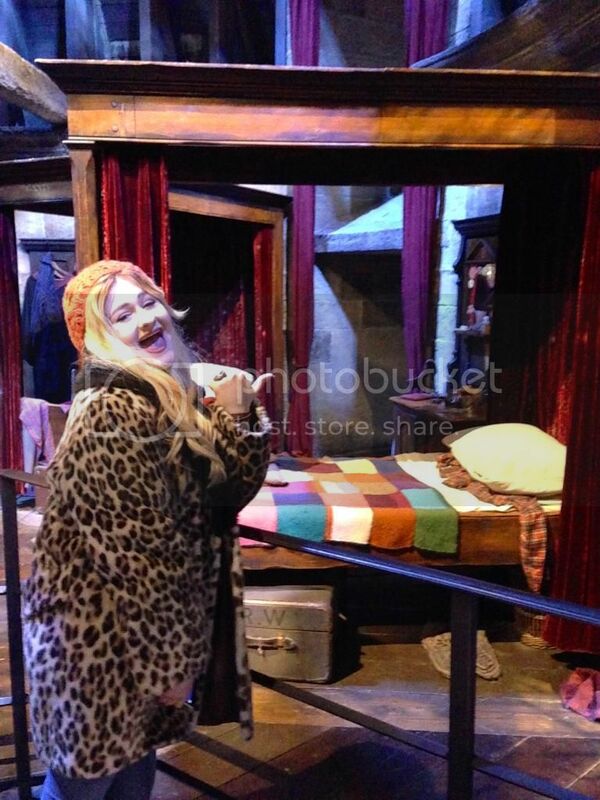 I loved the Gryffindor common room, it looked so warm and cosy. 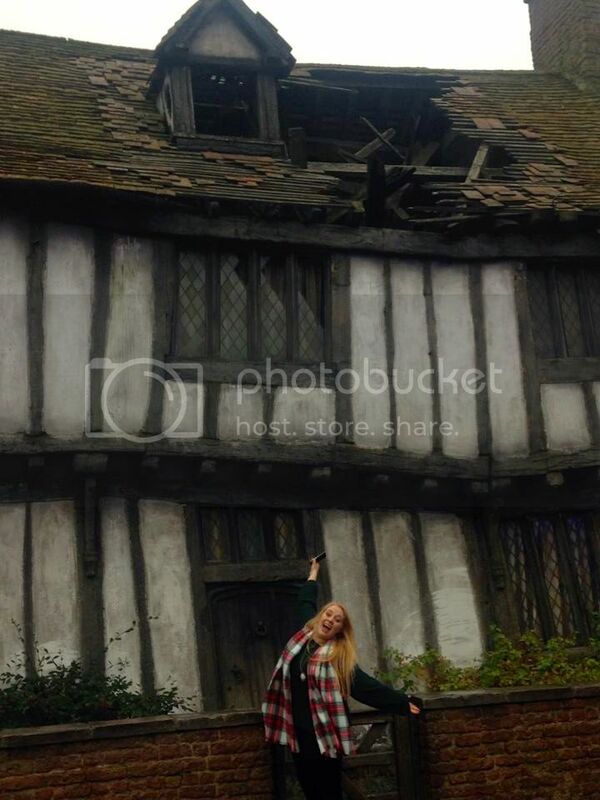 We also saw Dumbledore's office, Hagrid's hut, the potions room, and the Weasley's kitchen where you could chop the carrots and do the ironing with magic! 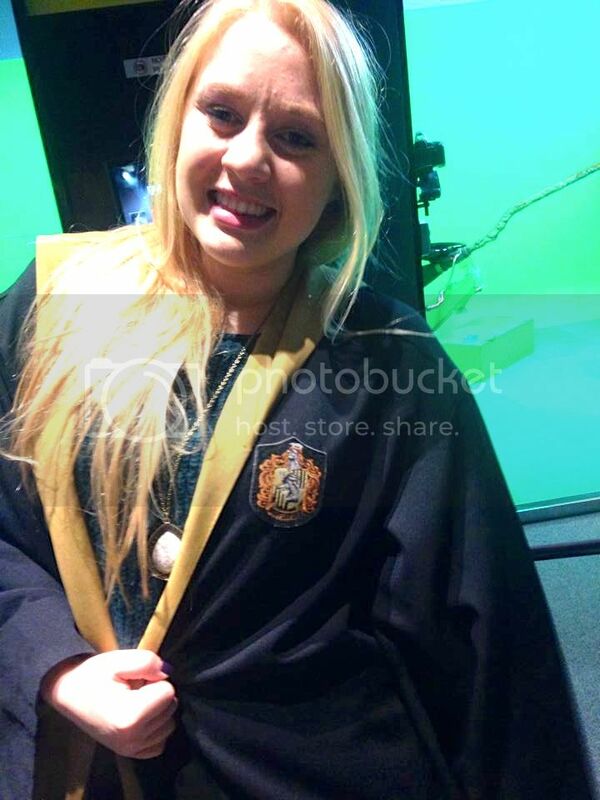 We also got to try out the green screen area where we flew on broomsticks and had a ride in the flying car, this was a bit of fun but the photos were a bit out of our price range! While we were inside we also decided to have some wands lessons doing some wand fighting moves, although it turns out we're pros at wielding a wand! 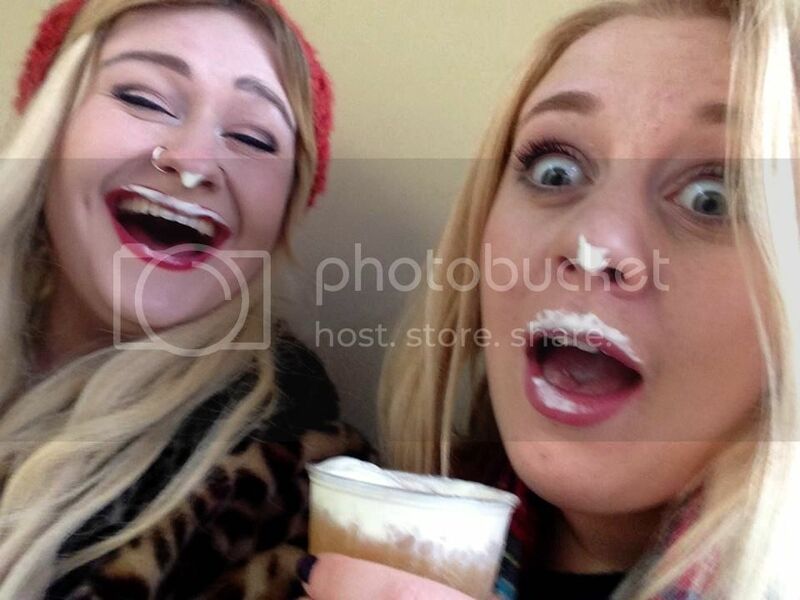 Probably my favourite part of the tour was the outside area, we grabbed a butterbeer which we didn't expect to be cold, but it was still enjoyable. 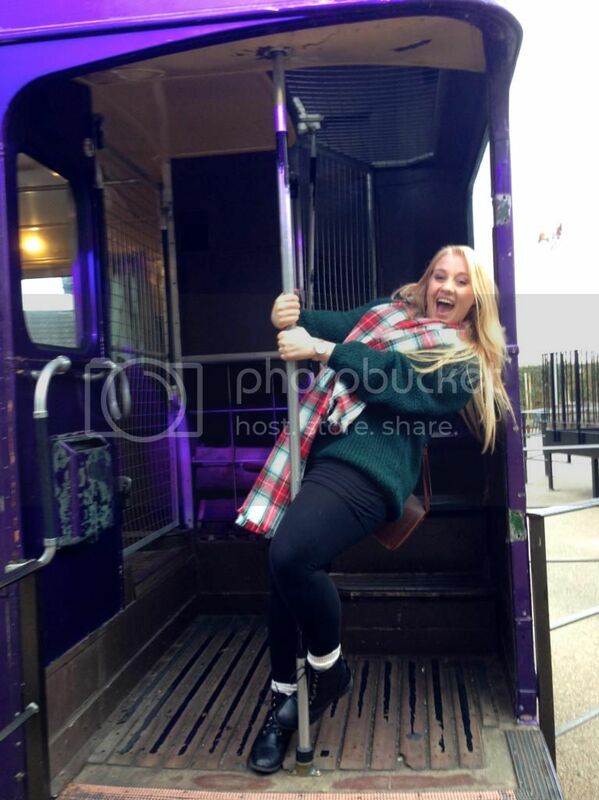 Then we made our way round the Knight Bus, Private Drive, the Potter's House, and the Bridge taking lots of photos. 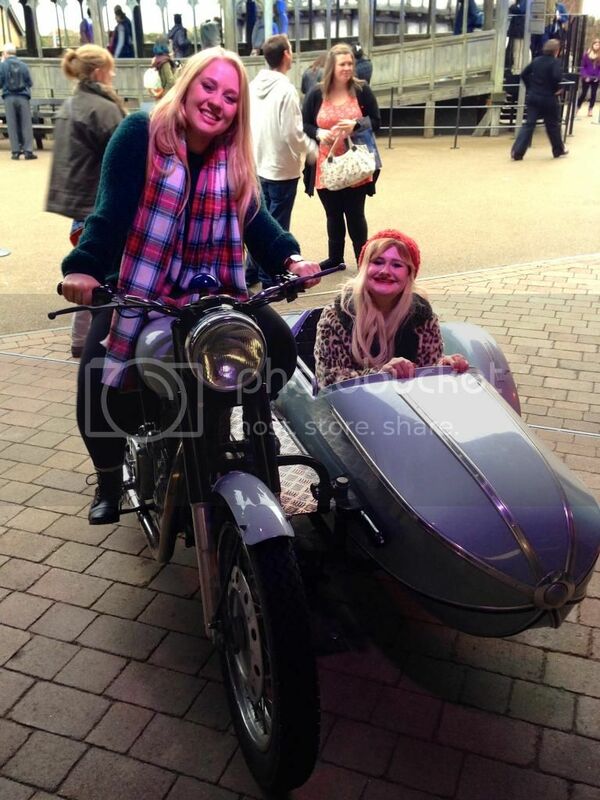 Then we posed on Hagrid's bike and in the flying Ford Anglia! Next we headed inside where we saw all the amazing masks, animatronics and technical drawings. 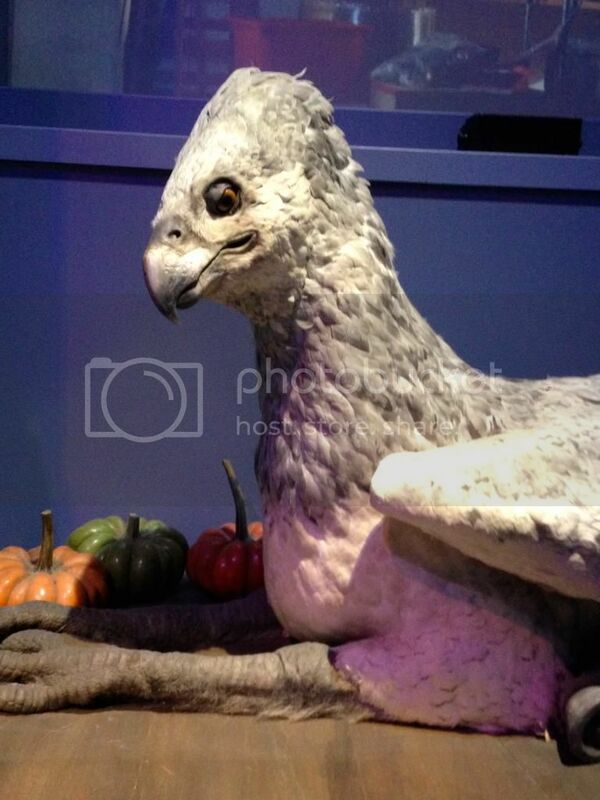 Buckbeak was so lifelike and moved which I loved! I also made sure to take lots of photos of the technical drawings and models for Josh as this is the area of film making he works in so he was really interested. 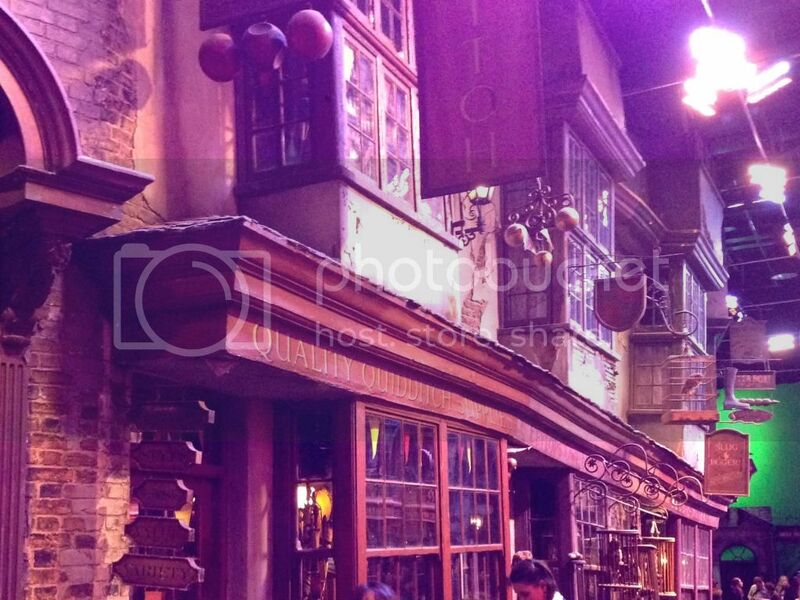 One of the best parts of the tour was Diagon Alley! 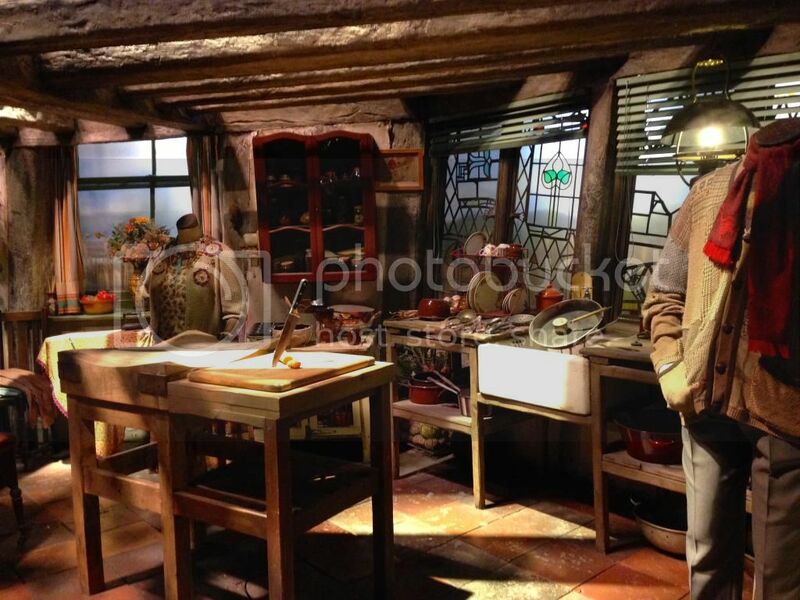 This was truly fantastic to see, you literally felt like you'd passed through the Leaky Cauldron into the wizarding world. 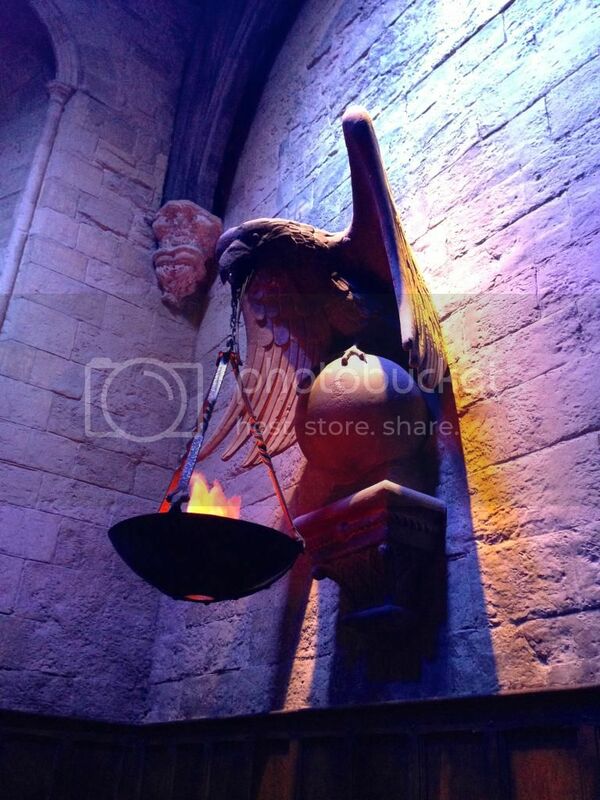 There was Gringotts, Flourish & Blotts, The Daily Prophet, Ollivanders and Weasley's Wizard Wheezes. 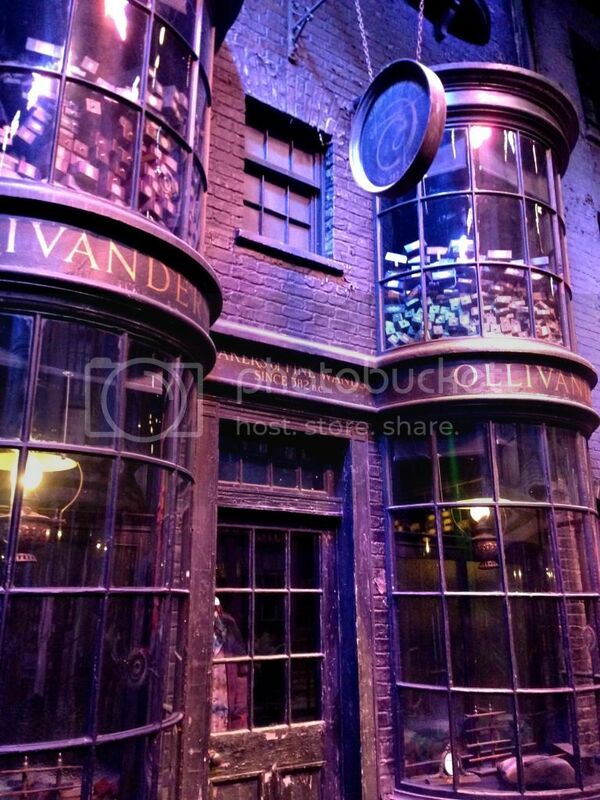 The street was cobbled and the buildings were all slightly wonky giving it that magic feeling, and the windows were all displayed with wands, broomsticks and robes. 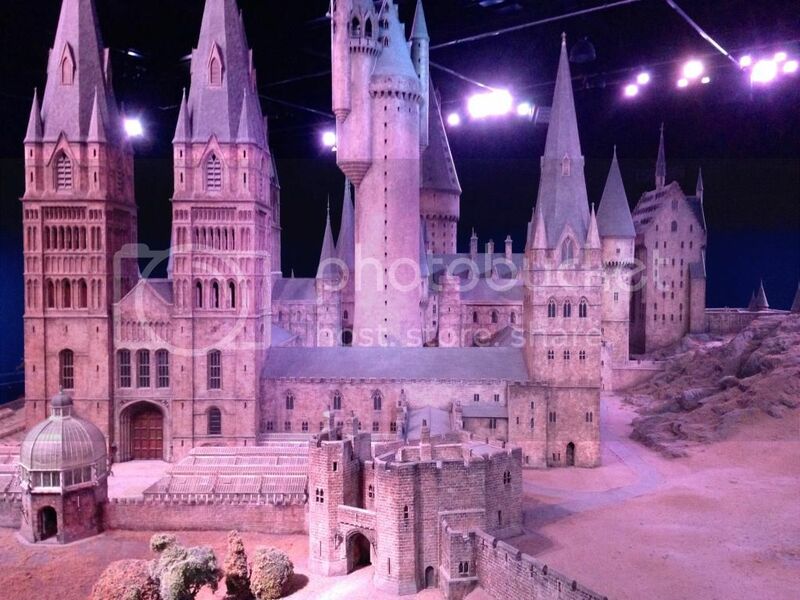 Even though I'd seen pictures and watched videos of people visiting the tour I was still awestruck when I saw the giant model of Hogwarts. It was huge and so intricately done, I just wanted to explore it all! I would have loved to have seen it covered in snow but we were a few weeks early, but it was still an amazing thing to see. 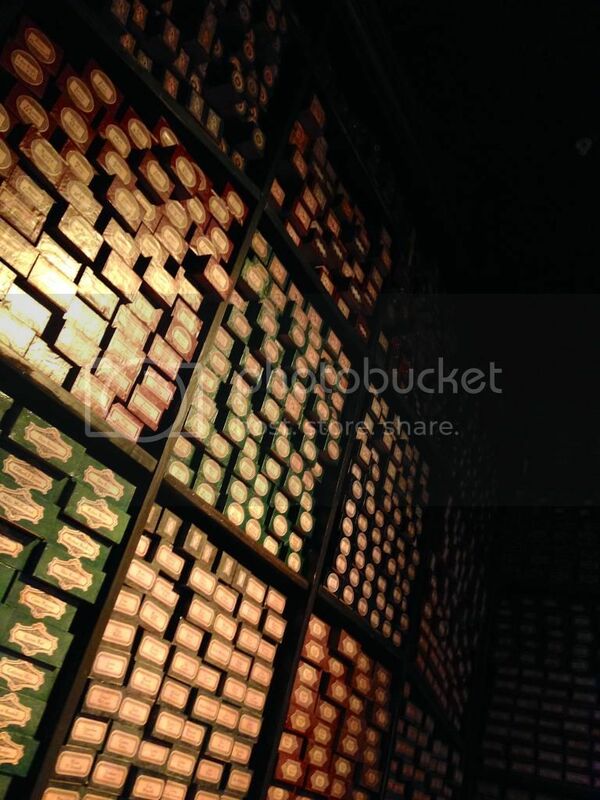 After seeing Hogwarts we went into 'Ollivanders' where the walls are covered with wand boxes, each one named after someone who worked on the Harry Potter films. There was a man there who could tell you where any person's wand was and what they did on the film, we even tested him by choosing a random persons name and seeing if he could point them out and he could! 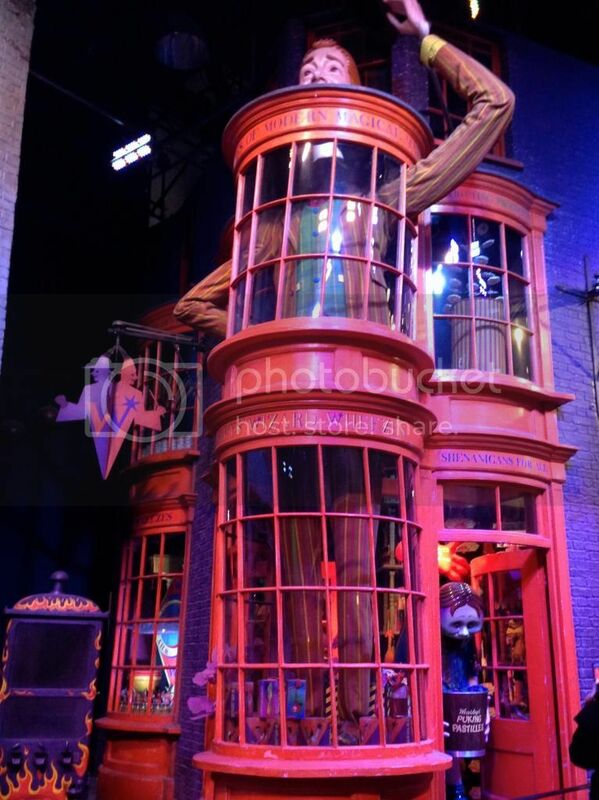 We were very impressed with this, and even more impressed when he told us he had worked on the films! Overall it was a really amazing day. I had been worried that it might 'ruin the magic' but if anything it did the opposite! Being a poor student I didn't get to take advantage of the gift shop as much as I'd like to, but I got myself a Deathly Hallows keyring as a memento. Harry Potter meant so much to me as a child and it still does! 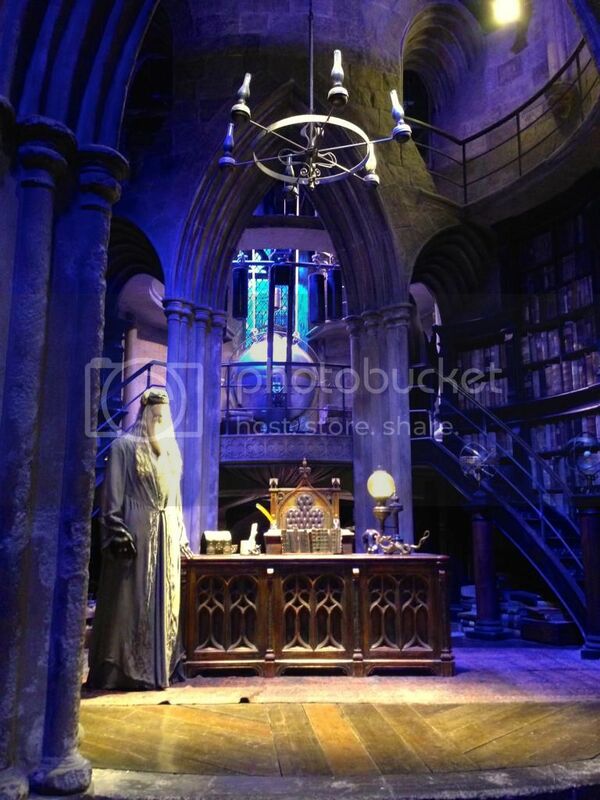 I love Harry Potter. Always. Ronan Keating was right. Life is a roller coaster, and right now I really am riding it. The past few weeks have been so up and down I don't even know how to feel. You may or may not know that I've recently been suffering with anxiety, as I mentioned in a previous blog post, and although things are getting better Im definitely still struggling. Although the medication I'm on for my anxiety is definitely helping it's by no means gone, and although Im not anxious every day like I was before, and it's not holding me back in the same way, I do feel like Im very up and down at the moment, like a roller coaster! The past few weeks I've had some really great days, my anxiety hasn't held me back and I've felt pretty great about myself. 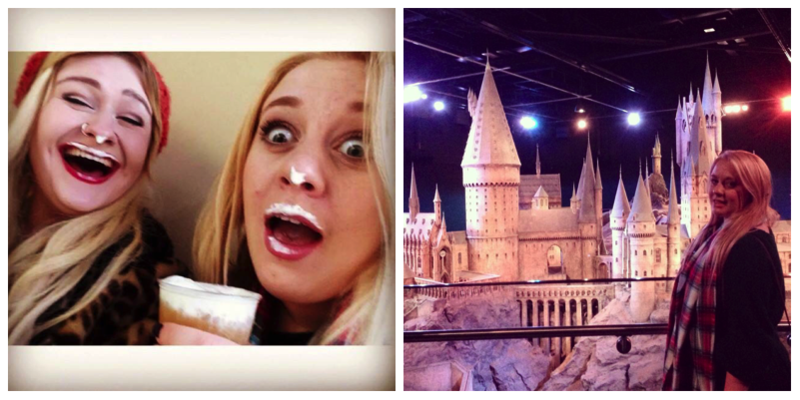 One of the really great things I've done in November was visit the Harry Potter Studios with my friend as a massive Potter fan I was so excited and had a really great day, I'd definitely love to go again and recommend it to any fans as it's such a great experience. 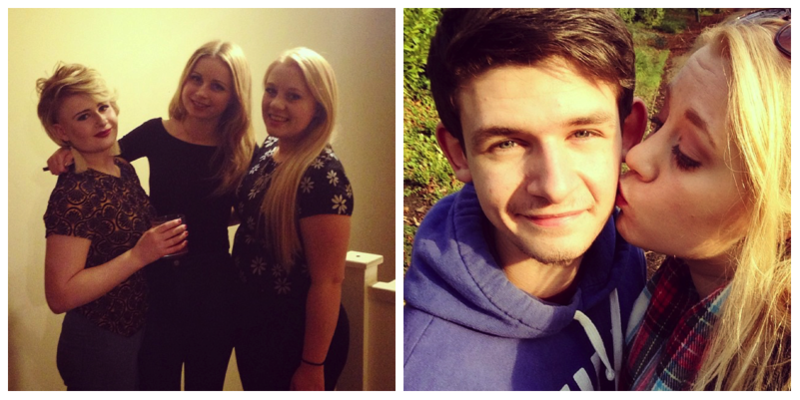 As I live quite close to the studios I had two of my uni friends come stay with me for the weekend, which was so great as I got to show them around and introduce them to some of my home friends. I've also managed to get back on top of my uni work, starting this year of with some pretty bad anxiety effected my work quite a bit and I've been working hard to catch up when I'm having a good day. This week I attended my first lecture in 6 weeks after a really encouraging chat with my lecturer who calmed my worries about not doing well after having missed so much. I've also got cracking with planning and reading for my dissertation, I'm still a bit behind where I would want to be, but Im feeling motivated about it and although the thought of writing 12,000 words makes me want to throw up Im just taking it slowly so I don't get overwhelmed. If any of you wanted to know, my dissertation is going to be looking at sexual violence towards women during armed conflict. Which sounds like a horrible topic but is something that really interests me as a Human Rights student. 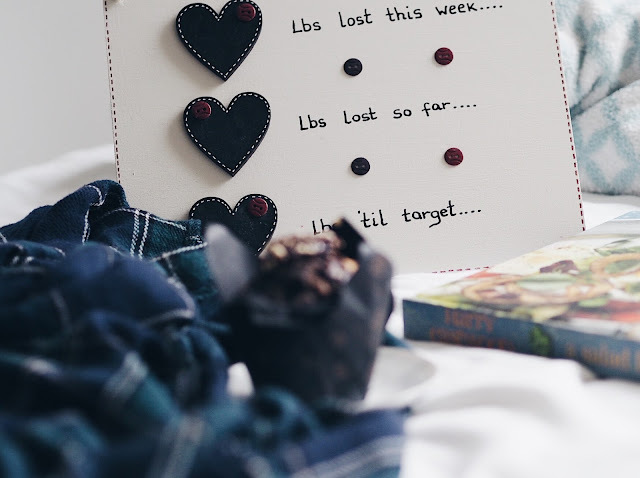 After my housemates and friends found out about my blog I've received a lot of encouragement which has inspired me to get back into it and start working hard again, so hopefully my blog can keep growing! This week I also had another great 'high' on this roller coaster with attending the premier for Audax, a film created by the UCLAN film production course that a lot of my friends, and boyfriend are part of. They worked on the film in second year and I saw how hard they worked, in fact I spent a lot of evenings helping my boyfriend Josh paint the set as he was the production designer of the film. Watching the film I was so proud of them and we all had a great evening, everyone dressed up in suits and nice dresses and then after watching the film we spent the rest of the evening in the pub celebrating. As I said before, this month has been very up and down, and I've got to be honest the down parts have been really bad. I'm still struggling with anxiety that somedays just hits me totally out of the blue and makes me want to curl up in my bed with chocolate and biscuits, which is usually my first response. In fact my eating habits have become so bad recently, when I start feeling down or anxious or sad I head to the shop and buy so much junk food which I just pig out and eat in bed. I've put on a lot of weight, over a stone in a month, which makes me feel so upset and angry and disappointed in myself. I don't feel comfortable or confident in clothes I used to love wearing, Im just not very happy with myself at the moment. Im currently seeing a councillor which has so far been really helpful in just getting me to open up and to also explore some of my issues and things I've been struggling with. Some days I feel great, motivated, confident and I know things are going to be okay, some days I feel so unsure and unconfident in myself and everything Im doing, and some days I feel so crap that I really hate myself and anxiety takes over and stops me doing anything. I hope this roller coaster Im on starts to slow down soon, because Im definitely ready to get off! I know lots of people are struggling with things, whether thats mental illness, physical illness, bullying, personal struggles, money struggles. Whatever it is I just want to let you know things will get better, no matter how crap they feel right now. I'm in a weird place at the moment where I have no idea how Im going to feel each day, I feel like Im just all over the place, but I know things will get better eventually I've just got to keep on keeping on and trying my hardest to keep my head above water. I know that the night must end and the sun will rise. As a student I'm always looking for the cheapest things and the best deals, and as a lover of breakfast I always make sure I've had something before I head out for the day. However sometimes I just don't have much time to spare and would rather spend an extra 10 minutes in bed than putting together breakfast, this does usually mean I grab something from the shop on the way to lectures but a breakfast bar for 65p barely touches the side! I decided to take matters into my own hands and get my bake on, well get my 'microwave and mix' on as this recipe doesn't involve any baking! These Homemade Cereal Bars are perfect to grab in replacement for breakfast or just as a mid day snack to get you through your essay. And they're easy and cheap to make! The recipe comes from Sal Godfrey's Cheaper Than Chips* recipe book. The beauty of this recipe is that you can really make it your own, you could use plain granola, or one with added fruit, mine has Raisins & Almonds in it. You could also use muesli or plain oats. Also you can decide which dried fruits to add, or like me you can substitute some fruit for chocolate chips! I also used Sweet Freedom as an alternative to Honey as it's just a bit healthier. 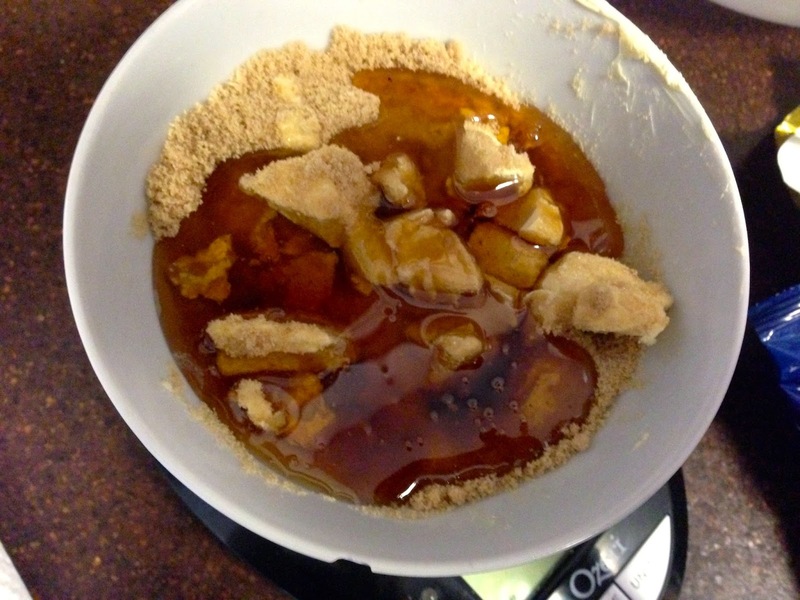 The first step is to measure out your honey, butter and brown sugar into a bowl and microwave it in 30 second bursts until it's all melted, make sure to stir in between each burst and that at the end you've got a smooth mixture that's doesn't feel grainy. Next weigh out your dry ingredients into a big bowl together, so that's the granola, dried fruit and chocolate chips, and half a teaspoon of salt. Then you just need to pour the butter mixture over the dry ingredients and stir until everything is combined. Then pour the mixture into either a brownie tin or a tupperware box lined with tin foil should do the job just as well. Make sure to push down the granola with a wooden spoon into the corners of the box and to make sure it's tightly compact. Then it's just into the fridge for an hour or so to cool and harden before you can cut it up with a sharp knife. You can decide the size of the pieces, the recipe says 12 but I reckon you could make them smaller and have more. Then just wrap these up individually in tin foil to keep them fresh and you can easily grab one on your way out the door. Now Im no baking pro and something always seems to go a little bit wrong for me, and I did have my problems with this recipe as when I went to cut it up into squares it wouldn't stay together and just feel apart. I'm not sure if this is because I didn't push it down together enough, or because I didn't use Honey. But none the less it still tasted amazing! I ended up rolling the mixture into little balls and wrapping in tin foil and putting them back in the fridge. They were still a bit flakey but they tasted amazing! Really sweet and crunchy and the perfect little snack. All in all this recipe was delicious and pretty inexpensive, especially if you've already got some of the ingredients in your cupboard. The Cheaper Than Chips recipe book has some really great cheap and easy recipes, and some great tips on how to spruce up your day to day meal recipes without spending a lot of money. The recipe for Pull Apart Pizza Bread looks delicious, and I can't wait to try Sal's recipe for Spag Bol as it's one of my favourite meals! I'd definitely recommend this recipe book to anyone on a budget, and especially to students as it keeps things simple and easy and doesn't add in hundreds of ingredients you're never going to use again! Each recipe has very easy to follow instructions and little tips and tricks or how to change things up. The other great thing about this book is that it's an E-book and therefore cheap at only £5, and you can get it up on your phone, tablet, kindle or laptop and you don't need to worry about always having the book on you! You can purchase Cheaper Than Chips* on amazon, and you can also check out Sally's other great recipes over on her blog Sal's Kitchen. I was provided with a digital copy of Cheaper Than Chips for the purpose of a review. However all opinions are my own.